The Senior Female Player of the year award is presented to Kaitlyn Williams for 2017. Kaitlyn receives this award as recognition of her commitment and achievement with the Canadian National Team. She was selected to the Senior National Team in 2011, achieving a near podium performance at that year’s Pan American Games in Rio. A podium finish came quickly thereafter as Kaitlyn helped Team Canada to a Bronze Medal at the 2013 Pan Am Cup, followed up with strong performances at the 2014 Commonwealth Games in Glasgow, and another podium finish and bronze medal on home soil at the 2015 Pan American Games. Kaitlyn continues to train hard and develop her craft as a goalkeeper, making her a formidable opponent for any international offense. Field Hockey BC is proud to recognize the 95 representative caps Kaitlyn has achieved for Canada to date, recognizing her as our 2017 Senior Female Player of the year. Adam receives this award as recognition of his on-going commitment and achievement with the Canadian National Team. We are extremely proud of Adam’s National Team accomplishments to date that began with major games honours in 2010 at the Commonwealth Games in India. Adam went on to represent Canada at the 2011 and 2015 Pan American Games, winning Silver on both occasions. He also represented Canada at the 2013 Pan American Cup, the 2014 Commonwealth Games, and several World League events, including the 2015 World League Semi-Final where Adam scored the shoot-out winner against New Zealand to qualify Canada for the 2015 World League Finals and 2016 Olympic Games. Adam also represented Canada at the ultimate event: the 2016 Olympic Games in Rio de Janeiro. Field Hockey BC is proud to recognize the 158 representative caps Adam has achieved for Canada to date and name him the 2017 Senior Male Player of the year. Regrettably, Adam was unable to attend the Awards Dinner. Ian Baggott, Chair of the Board of Directors at Field Hockey Canada, accepted the award on his behalf. The Senior Under 23 Female Player of the year award is presented to Lindsay Cole for 2017. Lindsay is a current member of the Women’s Junior Development Squad and represented Canada at the Junior Pan American Championship in 2016. Blessed with speed and the ability go past opposition players, Lindsay was an exciting and impactful member of this year’s Under 23 group. A natural forward, she had a willingness to play all over the pitch and led team defence to win the ball. When on the ball, she relished the opportunity to eliminate opponents, which brought an exciting attacking dimension to the team. Off field, Lindsay was a quiet and unassuming leader who helped gel the group into a team and we look forward to following her career as there is no doubt she will continue to dazzle as she transitions into senior squads. 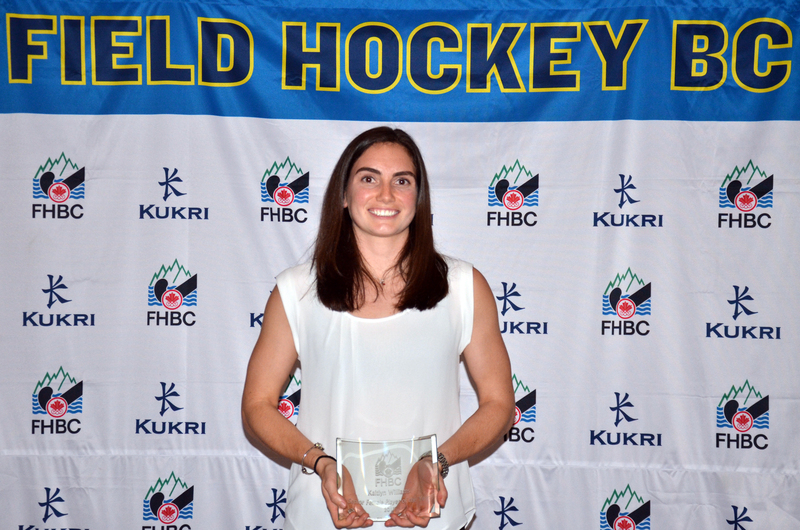 Field Hockey BC is proud to recognize Lindsay Cole as the 2017 Senior Under 23 Female Player of the Year. The Senior Under 23 Male Player of the year award is presented to Balraj Panesar for 2017. Balraj is a talented player, who made his competition debut for the Senior Men’s National Team this year at World League Round 2 and has played every game for Canada since. Balraj was also a member of the Men’s Junior National Team that won Silver at the 2014 Youth Olympic Games, and has represented Canada at two Junior World Cups. He has a good set of possession skills and plays extremely well under pressure. He is very professional in his approach and has a bright future ahead of him. Whilst we look forward to witnessing even greater things in the future, it is Field Hockey BC’s pleasure to recognize Balraj as the 2017 Under 23 Male Player of the Year. The Junior U-18 Female Player of the Year award is presented to Alissa Wong for 2017. Alissa Wong is an outstanding athlete who has developed into an impactful and integral player within Field Hockey BC programming. She is a skilled player who has an awesome work ethic, one that allows her to perform to the highest level. This past summer, Alissa helped lead the BC Rams team to a silver medal at the U18 National Championship. She was also recently identified as part of the Field Hockey Canada Junior Development Squad. Alissa’s future certainly looks bright and we are excited to see where she may go from here. It is Field Hockey BC’s pleasure to announce Alissa as this year’s U-18 Female Player of the Year. This Award was presented along with a $300 clothing voucher from Kukri Sports Canada. The Junior U-18 Male Player of the Year award is presented to Jamie Wallace for 2017. Jamie was a member of the Under 21 Men’s Junior National Team that took part in the FIH Junior World Cup in December 2016. He has since been named to the National Senior Development Squad and trains on a regular basis with the Men’s Senior National Team. He has used this experience and the knowledge gained to help improve the Under 18 BC Boys Rams team. Jamie was captain of the Rams and is an inspirational player who leads by example both on and off the field. It is Field Hockey BC’s pleasure to award the Junior U-18 Male Player of the year away to Jamie Wallace. This Award was presented along with a $300 clothing voucher from Kukri Sports Canada. The Junior U15 Female Player of the Year award is presented to Kate Rogers, and accepted by her dad, Cal Pye. Over the past year, Kate Rogers has grown to be a dominant player who demonstrates great composure, skill and dedication to improving herself. As a captain and important leader on the 2017 U15 BC Girls Rams team, she used her outstanding work ethic and motivation to increase the level of intensity and competition of those playing with her both in training and games. Not only was Kate a force in the attacking structure, she was a critical piece to the defensive unit that allowed no goals against during the Team BC season. Kate has a very bright future ahead of her, and we look forward to watching her grow. It is Field Hockey BC’s pleasure to announce Kate Rogers as this year’s U-15 Female Player of the year. Unfortunately, Kate was unable to attend as she was competing at a tournament in Florida. Her father, Cal Pye, accepted the award on her behalf. This Award was presented along with a $300 clothing voucher from Kukri Sports Canada. The Junior Male Player of the year is presented to Amol Bassi for 2017. Amol displayed qualities that fostered a positive performance environment for the whole BC team this summer. Amol was a member of the U15 BC Boys Rams that captured the Gold Medal at the U15 National Championship in July. Throughout the Provincial Program, Amol was always on time, was open to new experiences and advice, continuously looked for ways to improve holistically, maintained a positive outlook and was encouraging even when things got tough. The future certainly looks bright and we all look forward to seeing Amol’s continued growth in the future. 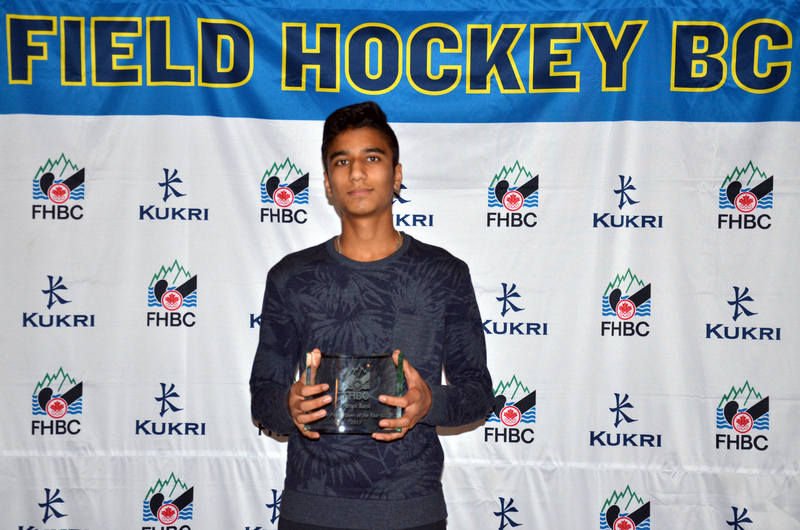 It is Field Hockey BC’s pleasure to announce Amol Bassi as this year’s U-15 Male Player of the year. This Award was presented along with a $300 clothing voucher from Kukri Sports Canada. The Barbara Schrodt Award is presented to “someone who has made a difference to women’s field hockey in BC”. The Award was presented to Brian Lewis for 2017. 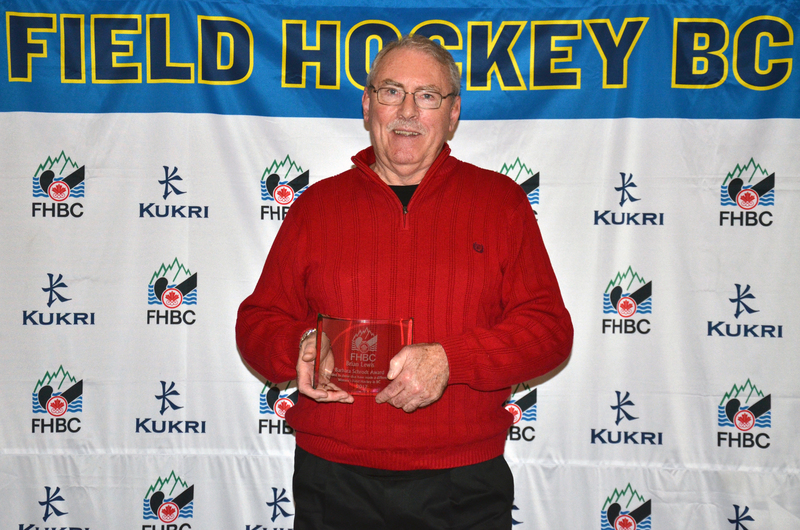 Brian has been a leading force with field hockey in BC for over thirty-five years. In the year 2000, Brian made the decision to take his involvement with high school field hockey to another level and entered a female team into the local league. From this decision, the Tri-City Eagles Field Hockey Club was borna dn Brian has been instrumental in the Club’s growth and governance for the last seventeen years and counting. Under his guidance and that of his executive, the Club continue to extend opportunities in the Tri-City area with numerous senior and junior teams playing in local, regional, and provincial leagues and events for much of the year. Just this last season, the Club broke the 500 member barrier and Brian rightfully should take great pride in taking a single team and shaping a Club community. 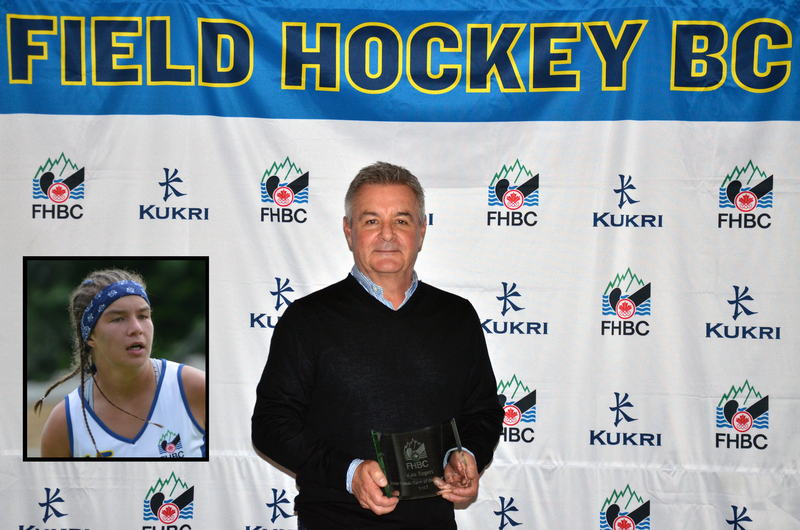 Brian’s efforts, dedication and commitment to the sport of field hockey were honoured by the Coquitlam Sports Hall of Fame in 2014 and it is Field Hockey BC’s pleasure to recognize Brian as the 2017 Barbara Schrodt Award Winner. The Contribution to Men’s Field Hockey Award is presented to Narinder Sangha for 2017. Narinder is an absolute legend in BC Field Hockey terms and is without a doubt one of the most dedicated builders and supporters of field hockey across Canada. Whether it is playing, coaching, umpiring, technical officiating, volunteering, or advocacy, Narinder continues to give back to the sport he loves and share his vast knowledge and experience with all. Instrumental in Club Governance and Support with India Field Hockey Club, Narinder still manages to find time to lead the development of the Vancouver Junior League as President and works tirelessly with the City of Surrey to further develop the first class facilities at Tamanawis Park. Playing an integral role in convincing the City to develop Tamanawis Park in 2006, Narinder continues to drive forward for a third field to complement existing facilities. It is a fact that Field Hockey in and around the City of Surrey is booming, none more so than in the junior boys ranks in particular, and this is in no small part due to to continued dedication of Narinder and the network of committed local volunteers. It is Field Hockey BC’s absolute pleasure to present the 2017 Contribution to Men’s Field Hockey Award to Narinder Sangha. The Coach of the Year Award for 2017 is presented to Andrew Kanerva, by Eric Broom. It has been a pleasure to watch Andrew’s growth as a coach and his tranistion from elite player to talented young coach. Andrew is a serious student of the game of field hockey and the art and science involved in coaching it. He looks for learning moments and is open to new ideas. As such, he was able to lead the BC Boys Rams to the gold medal at the 2017 U15 National Championship and achieved this with a firm focus on development – a testament to his long term approach to player development. Field Hockey BC is pleased to recognize Andrew for his leadership and commitment to BC athletes, as well as to Sport Science, recognizing him as the 2017 Coach of the Year. The award was presented by Field Hockey BC’s Coaching Director, Eric Broom. The Umpire of the Year Award for 2017 is presented to Margaux Brand, by Alan Waterman. Margaux has been a committed umpire now for close to ten years. She has worked hard to challenge herself over this time and her dedicated work ethic has paid dividends, as Margaux has gradually climbed the officiating ranks, gaining essential experience along the way. This past year, Margaux has been an active umpire in local league play, club championships, junior festivals, high performance events and most recently made her debut on the international stage. In November, Margaux took on her first international appointment at the Pan American Hockey Federation Central American and Caribbean Games qualifying tournament in Jamaica. She received her FIH Umpiring Badge at this tournament and should be seeing more international appointments in the future. It is for both her continued dedication, and her progression from a community umpire to the international fold that Field Hockey BC recognize Margaux as the 2017 Umpire of the Year. Alan Waterman, Field Hockey BC’s Umpiring Director presented the award. The Senior Male Player of the year award is presented to Iain Smythe for 2016. Iain receives this award as recognition of his on-going commitment and achievement with the Canadian National Team. We are extremely proud that we can add ‘Olympian’ to Iain’s achievements, a crowning glory in his field hockey journey to date, a journey with the National Team which began in 2009. Iain has represented the Canadian Team at the Commonwealth Games twice, the Pan-American Games twice, winning Silver on both occasions and most recently on home soil in Toronto in 2015, and this past year competed as a member of the Rio Olympic Games team. Field Hockey BC is proud to recognize the 134 representative caps Iain has achieved for Canada and name him the 2016 Senior Male Player of the year. The Senior Female Player of the year award is presented to Sara McManus for 2016. Sara receives this award as recognition of her commitment and achievement with the Canadian National Team. She was selected to the Senior National Team in 2011, achieving a near podium performance at that year’s Pan American Games in Rio. Sara’s career highlights include a silver medal at the 2012 Junior Pan American Championships, participation in the 2013 Junior World Cup, senior representation at the Commonwealth Games in Glasgow in 2014, and a bronze medal finish at the Pan-American Games in 2015 on home soil. Field Hockey BC is proud to recognize the 111 representative caps Sara has achieved for Canada to date, recognizing her as our 2016 Senior Female Player of the year. The Senior Under 23 Male Player of the year award is presented to Rowan Childs for 2016. 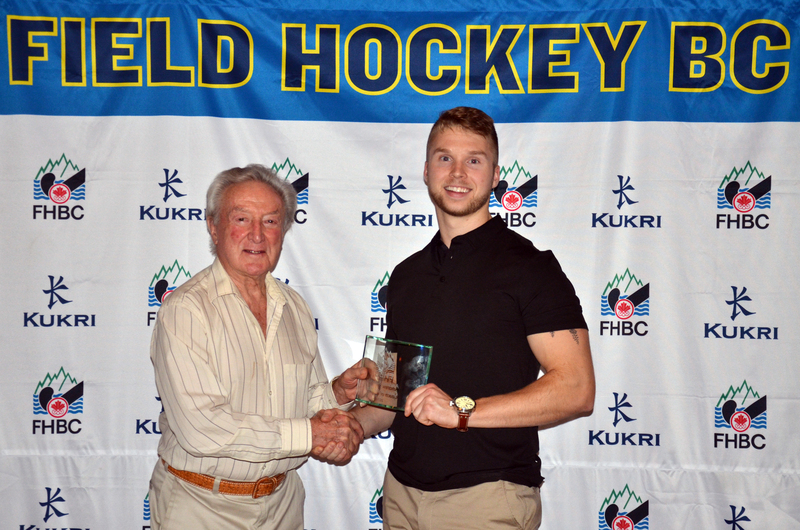 Field Hockey BC is proud to recognize Rowan as the Senior Under 23 Male Player of the Year. We wish him luck as he competes at the 2016 Junior World Cup in Lucknow, India in December. The Senior Under 23 Female Player of the year award is presented to Thora Rae for 2016. Thora has been part of our regional and provincial program in recent years, having been selected into our Team BC Provincial Blue teams at both the Train to Train and Train to Compete level. Resuming training with us for the 2015/16 season, Thora was set to become one of our leading lights again at the 2016 Nationals, however early in the year she was selected into the Women’s National Team program and so progressed out of our programming into Field Hockey Canada’s centralized training environment. A huge achievement in itself. However, her successful season did not stop there, with Thora continuing her progress and ticking off another landmark to gain her first Canadian cap as a 16 year old during the tour to New Zealand in March. Whilst extremely happy of Thora’s progress, we are not surprised. She has an outstanding work rate, a fantastic attitude and a high level of ability. Although it is unusual for us to recognize a junior player from outside of our Provincial team ranks, Thora’s outstanding progression into the Women’s National Team more than warrants recognition in this new Awards Category, an award that we are pleased to align, from next summer onwards, to the new Under 23 National Championships. 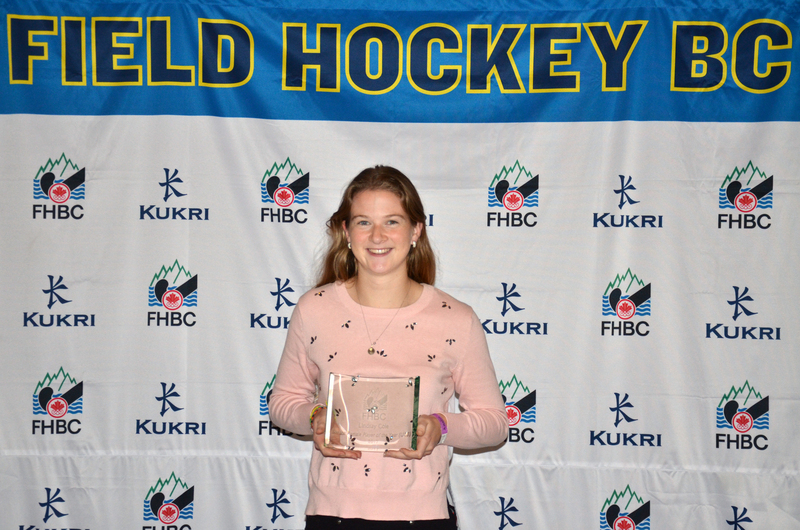 Field Hockey BC is proud to recognize Thora Rae as the 2016 Senior Under 23 Female Player of the Year. The Junior U-18 Male Player of the Year award is presented to Arjun Hothi for 2016. 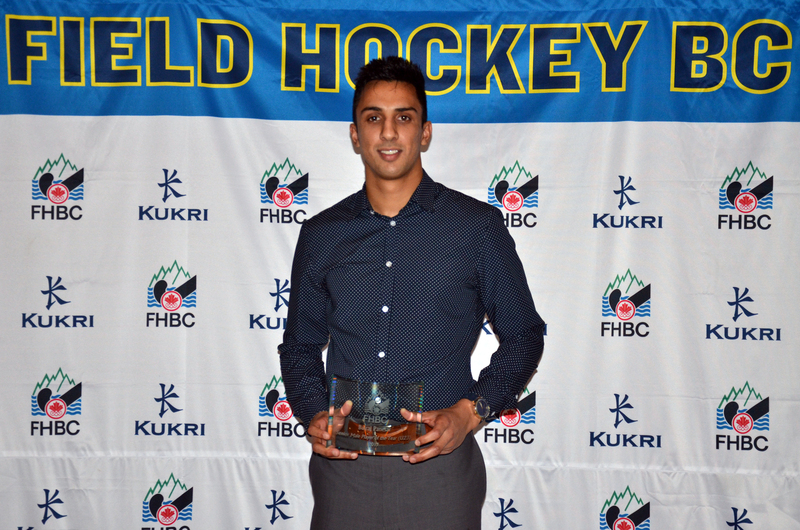 It is Field Hockey BC’s pleasure to award the Junior U-18 Male Player of the year away to Arjun Hothi. This Award was presented along with a $300 clothing voucher from Kukri Sports Canada. The Junior U-18 Female Player of the Year award is presented to Anna Mollenhauer for 2016. It is Field Hockey BC’s pleasure to announce Anna as this year’s U-18 Female Player of the Year. The Junior Male Player of the year is presented to Roopkanwar Dhillon for 2016. Roop was selected to the top Under 15 BC Team competing at this year’s Under 16 National Championship in Brampton Ontario, with the team bringing back the gold medal. His Team BC coach writes, ‘Roop was the captain of BC Blue, and was instrumental in leading the team both on and off the field. His leadership skills grew from strength to strength throughout the National Championship, culminating in a goal in the final – his third of the tournament, which gave BC Blue an early lead in the gold medal game. Roop is a worthy winner of this year’s award and can take great satisfaction in his efforts both in training and during the 2016 Nationals’. It is Field Hockey BC’s pleasure to announce Roopkanwar Dhillon as this year’s U-15 Male Player of the year. The Junior Under 15 Female Player of the Year award is presented to Aerin Park for 2016. Aerin has shown outstanding progress in all aspects of her development during the past 2 seasons in the Field Hockey BC program. Quiet and unassuming, Aerin works hard in all sessions; she is brave, technically very strong, a brilliant shot stopper and always keen to learn and improve. Last year Aerin’s work saw her selected into the Train to Train Team BC Provincial Blue team, where she played an outstanding tournament, helping BC Blue reach the final. Her performances have seen her promoted into Field Hockey Canada’s Junior Development Squad for this season and it is for this progress and these achievements that we are pleased to recognize Aerin this year. 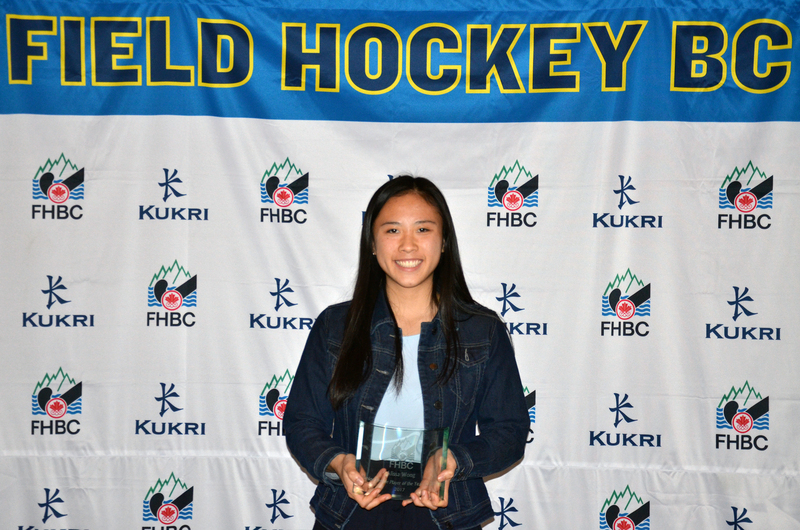 It is Field Hockey BC’s pleasure to announce Aerin Park as this year’s U-15 Female Player of the year. Unfortunately, Aerin was unable to attend as she was competing at a tournament in Florida. Eric Broom accepted the award on her behalf. The Barbara Schrodt Award is presented to Ronnie Lee for 2016 and is an award presented to “someone who has made a difference to women’s field hockey in BC”. Field Hockey BC is proud to recognise the commitment Ronnie continues to give to players, coaches and officials alike. Ronnie was regrettably not able to attend the Awards Dinner. Ian Baggott, Field Hockey Canada Presiedent, accepted the award on her behalf. The Contribution to Men’s Field Hockey Award is presented to John McBryde for 2016. John has an incredible history in Field Hockey both as a representative athlete with both Hockey Australia and Field Hockey Canada, and as a builder and supporter with the FIH, the Pan-American Federation and closer to home with Field Hockey BC and with the Vancouver Hawks Club. Whilst recognising John’s multi-faceted career, it is his recent leadership in reigniting master’s hockey in Canada that brings Field Hockey BC to honour John with this award. Three years ago John made it his mission to assess whether there was an avenue to return men’s masters hockey to the annual calendar. With a top down strategy, John convinced Field Hockey Canada to commit to a master’s program and in doing so, provide the platform for master’s athletes to represent Canada at the Masters World Cup. This they did with both men’s and women’s teams travelling to Australia for the Masters World Cup earlier this year. Such opportunities owe a great deal to John’s vision and commitment, and there seems to be no letting up as he continues his efforts towards the next Masters World Cup in Spain in 2018. 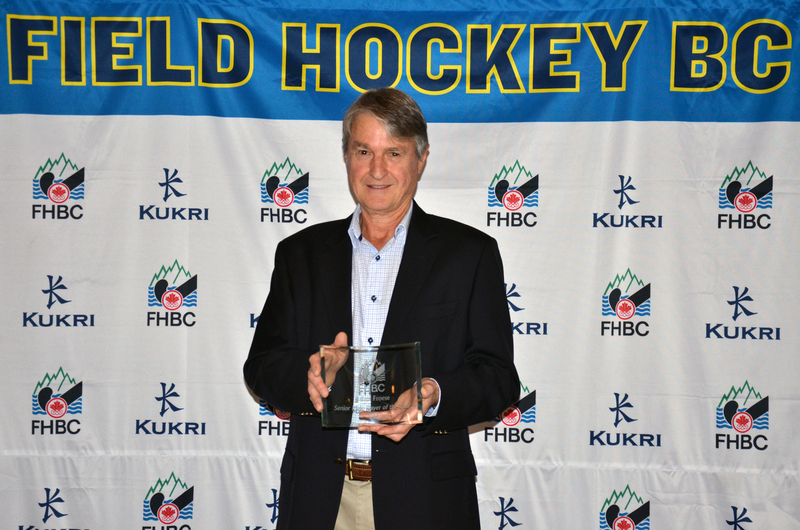 Field Hockey BC is proud to recognise the commitment John continues to give to Field Hockey in BC and across Canada, recognizing him as the 2016 recipient of the Contribution to Men’s Field Hockey Award. The 2016 Coach of the Year Award is presented to Paul ‘Bubli’ Chohan. Hall of Famer, Bubli Chohan has been coaching within our regional and provincial programs for more than 10 years. He receives this award in recognition of his outstanding success and leadership in coaching the Train to Compete BC Blue Team to Gold at the National Championships, beating the current national title holders and hosts Ontario on their home turf. Bubli is no stranger to leading Team BC teams to success, but what makes this year’s success worthy of this award is the manner of BC’s win. Going to Ontario without BC’s identified Junior Development Squad players, BC faced a full strength Ontario team which included 5 junior national team players. This did not disturb BC, who played an outstanding game to record the win, picking up the Gold Medal and re-gaining the accolade of being National Champions in the process. 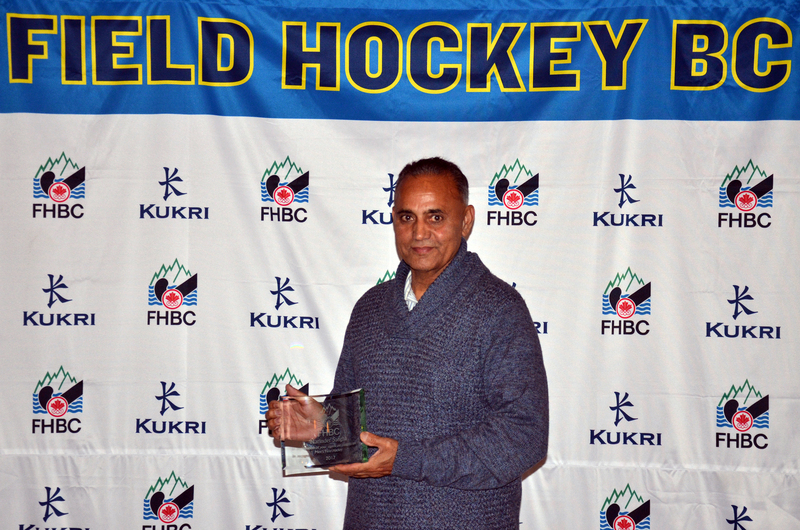 Field Hockey BC is pleased to recognize Bubli for his continued efforts and commitment to BC athletes, recognizing him as the 2016 Coach of the Year. The award was presented by Field Hockey BC’s Coaching Director, Eric Broom. The Umpire of the Year Award is presented to Tyler Klenk for 2016. Field Hockey BC is proud to name Tyler as our Umpire of the Year Award Recipient. The award was presented by Field Hockey BC’s Umpiring Director, Alan Waterman. Richard receives this award as recognition of his on-going commitment and achievement with the Canadian National Team. Richard achieved his first cap against South Africa in 2004. A decade later, Richard has represented the Canadian Team at the Commonwealth Games, the World Cup and the Pan-American Games, winning Gold in 2007. Field Hockey BC is proud to recognise the 123 representative caps Richard has achieved for Canada in naming him the 2014 Senior Male Athlete of the Year. Richard unfortunately was not able to attend as he was on duty representing his club in European competition. Field Hockey Canada Chairman, Ian Baggott, accepted the award on his behalf. Dani receives this award as recognition of her commitment and achievement with the Canadian National Team. She was selected to the Senior National Team in 2010, achieving her first cap against India in Vancouver. Dani’s career highlights to date include multiple FIH events, as well as, representation at the Pan American Games in 2011 and the recent Commonwealth Games in Glasgow this past summer. Field Hockey BC is proud to recognise the 76 representative caps Dani has achieved for Canada to date. Kristina’s Team BC Coach writes; Kristina was our unsung hero. She showed the ability to play as part of the team and as an individual able to influence a game. She showed her professionalism to work hard at each and every practice even after the long ferry rides from the Island. She led by example and was extremely coachable. In the National Championship final, Kristina controlled the backfield as wave after wave of the opposition attacked while making critical interceptions and tackles. Kristina was a credit to her team and fully deserves this recognition as Under 18 Female player of the year. Jamie was selected to the top Under 15 BC Team competing at this year’s Under 16 National Championship in West Vancouver, with the team bringing back the silver medal. His Team BC coach writes, ‘Jamie’s technical abilities allow him to have a big impact in games and training. He exhibited good leadership skills both on and off the pitch and above all led by example in his ethic for hard work. Jamie’s future in Field Hockey is bright and he is very deserving of this award’. Sara was a leader for the Under 15 BC Blue team that captured Silver medal at this year’s U16 National Championship. Her Team BC Coach writes, ‘Sara is a young athlete who leads by example, has a competitive drive, excellent work rate, and a team first mentality. This helped bring the team together both on and off the field. She continually asks for feedback and understands there is always more work to be done. Sara fully deserves this recognition as Under 15 Female Player of the Year’. Jamie Wallace, Sales Director of Kukri Sports Canada, presented the award to Sara. The Barbara Schrodt Award is presented to Gail Williams for 2014 and is an award presented to “someone who has made a difference to women’s field hockey in BC”. Over the last 6 years, Gail has been technical advisor, judge, officer and director for a multitude of local, regional, provincial, and national events across BC. Technical officiating across the World is still very much a voluntary occupation and Field Hockey BC is extremely fortunate to have a number of dedicated and extremely knowledgeable technical officials. Gail is one of a team of individuals committed to giving of their time to create a first-class environment for athletes and their coaches to play and compete. It is fitting that Gail follows other technical officials that have been honored to receive this award. A long-time supporter of the Vancouver Men’s Field Hockey League, Colbin agreed to step into the considerable shoes of Patrick Oswald and take on the position of President to the league’s Board of Directors for the season 2011-2012. As with many of our community volunteers, Colbin has continued in this role, now entering his third year in office, and we sincerely hope that this award goes some way to recognising his on-going contribution to our sport. Peter wrote, ‘I was absolutely amazed by the Canadian team’s performance. It was clear that our team was punching above its weight. This team had that magical element we all need in sport – belief. Equally obvious to me was that this belief was imposed, nurtured and fostered by the head coach, Indy Sehmbi. He was remarkable with this team. I watched him lead his team in game after game defeating higher ranked teams one after the other and ultimately winning silver at the Games’. In recognition of the considerable achievement in winning the Silver medal at the 2014 Youth Olympic Games, Field Hockey BC is proud to award its first Player Recognition Awards to the five members of the team from BC. Although there are many umpires across BC who play an integral role in the development of our sport, there is none more deserving over the course of the last year than Julie Brereton. Julie has been active at more events across BC than any other female umpire during the last year, has worked as an umpire mentor at both the club and provincial level, and took on a leadership role in the hosting and officials management of our largest club festival of 2014. There was only one umpire who attended more events and took on more assignments than Julie our Female Umpire of the Year, and that was Pat Dunn. This award however is not given solely on the amount of work taken on but recognises the impact and quality of the work and the dedication of the individual concerned. Pat is an invaluable asset to field hockey in BC, delivering a quality experience to athletes but also in taking the time to mentor other officials. In some small way we hope that this award recognises the contribution Pat continues to make within our community. Philip receives this award as recognition of his on-going commitment and achievement with the Canadian National Team. Philip achieved his first cap against Netherlands Antilles in London Ontario in 2004. Nine years later, Philip has represented the Canadian Team at the Commonwealth Games, the World Cup and the Pan-American Games. Field Hockey BC is proud to recognise the 126 representative caps Philip has achieved for Canada in naming him the 2013 Senior Male Athlete of the Year.This award is presented by Ian Baggott, Board Chair for Field Hockey Canada. Abigail too receives this award as recognition of her commitment and achievement with the Canadian National Team. Abigail was selected to the Senior National Team in 2009, achieving her first cap against Ireland in Dublin. Abigail’s career highlights to date include multiple FIH events, as well as, representation at the Commonwealth Games in 2010. Field Hockey BC is proud to recognise the 91 representative caps Abigail has achieved for Canada in naming her the 2013 Senior Female Athlete of the Year. Samantha, or Sam as she is better known, was selected to the top BC Team competing at this year’s Under 18 National Championship, the team bringing back the gold medal. Her coach writes, ‘Sam is a tremendous athlete she is reliable and dependable and one that you can always count on to compete against anyone. Sam has a team first attitude and is very coach-able. Sam has a bright future in field hockey’. It is Field Hockey BC’s pleasure to award the Junior Under 18 Female player of the year award to Samantha McIlwrick. This Award along with a $300 clothing voucher from Kukri Sports Canada is presented by Wendy Hughes, General Manager of Kukri Sports Canada and Susan Ahrens, Provincial Coach at Field Hockey BC. Michael was selected to the top Under 15 BC Team competing at this year’s Under 16 National Championship in Brampton Ontario, with the team bringing back the silver medal. His Team BC coach writes, ‘Michael is an athlete with a great natural ability. His offensive and distribution skills are at an extremely high level and he has the ability to single-handedly change the course of a match. Michael is a versatile player who although best suited to play in the midfield, proved at Nationals that he can be very influential and score some important goals as a forward. If he keeps working hard and improves his defensive techniques, Michael can reach any level he sets his mind on. Michael is very deserving of this award’. 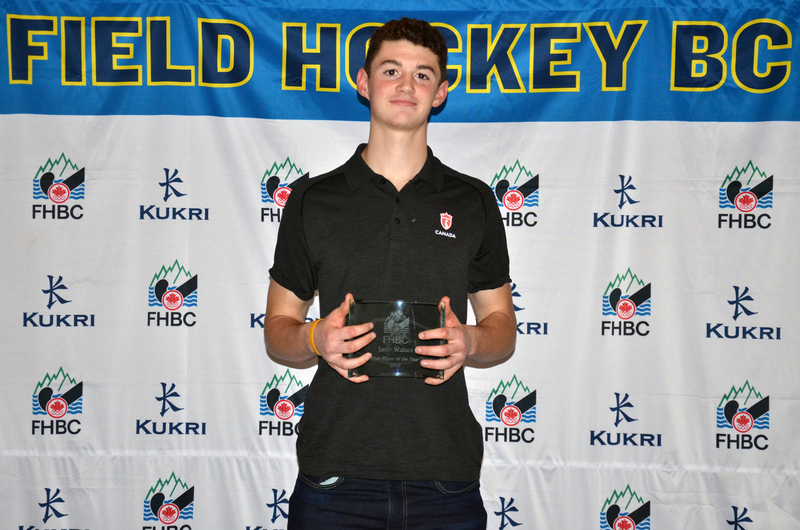 It is Field Hockey BC’s pleasure to award the Junior Under 15 Male player of the year award to Michael Brown. This Award along with a $300 clothing voucher from Kukri Sports Canada is presented by Jamie Williams, Sales Director for Kukri Sports Canada and Philip Wright, Senior Male Player of the Year and member of Team Canada. Nathalie was a leader for the Under 15 BC Blue team that captured Bronze at this year’s U16 National Championship. From the trials to the first practice to the very last game, Nathalie constantly led by example. Her work ethic, dedication to the team and sport as well as her ability to make her teammates laugh was a key part of this year’s BC Blue team. Nathalie was voted one of two captains on the team and regardless of the honour she could always be counted upon to set the tone. Nathalie values her team mates, understands what it is to compete and was a superb role model for the high performance program. It is Field Hockey BC’s pleasure to award the Junior Under 15 Female player of the year award to Nathalie Hunter. This Award along with a $300 clothing voucher from Kukri Sports Canada is presented by Wendy Hughes, General Manager for Kukri Sports Canada and Abigail Raye, Senior Female Player of the Year and member of Team Canada. The Barbara Schrodt Award is presented to Brenda Rushton for 2013 and is an award presented to “someone who has made a difference to women’s field hockey in BC”. Over the last 10 years, Brenda has been technical advisor, judge, officer and director for a multitude of local, regional, provincial, national, and international events across BC and Canada. Technical officiating across the World is still very much a voluntary occupation and Field Hockey BC is extremely fortunate to have a number of dedicated and extremely knowledgeable technical officials. Brenda is one of a team of individuals committed to giving of their time to create a first-class environment for athletes and their coaches to play and compete. It is fitting that Brenda follows other technical officials that have been honored to receive this award. In fact every one of our annual athlete, coach and official award winners this evening will have been involved in at least one event officiated under Brenda’s guidance. Sue Jameson accepts the award on behalf of Brenda Rushton, presented by Sue Demuynck, President of Field Hockey BC. Rumor has it that Mark and in fact all the boys in the Baggott household were born with a field hockey stick in their hand, and that it was agreed at an early age that ‘field hockey for life’ really did mean just that! Mark has taken on many roles as a player, coach, and volunteer at both club and league level on the Lower Mainland but it is for his commitment to junior boy’s field hockey development and thereafter junior field hockey development with the Victoria Junior League that Field Hockey BC recognises Mark this evening. At a time when the numbers of boys participating in field hockey on Vancouver Island and indeed within the Victoria Junior League were diminishing, Mark played an active role as both coach and administrator in an effort to turn things around. I am sure Mark will recognise the members of the Vancouver Island community who assisted in the upturn of numbers over the course of the last three years, but it is Field Hockey BC’s pleasure to recognise Mark’s commitment and continued role in developing junior and in particular boys field hockey on Vancouver Island. This Award is presented by Michael Brown, Under 15 Male Athlete of the Year and member of Field Hockey Victoria. Sarah began coaching for the newly amalgamated Field Hockey BC in 2005. She has since coached regionally and provincially for Field Hockey BC and continues to play an important role with the coaching team at West Vancouver Field Hockey Club. Sarah coached the Train to Compete Team BC White team this year, with success at both the India Club Tournament and a Bronze medal at the Under 18 National Championship. Over the course of the last eight years, a large percentage of athletes under the tutelage of Sarah have gone on to receive representative Canadian honours and Field Hockey BC is very proud to have such a knowledgeable and experienced coach giving back to the next generation of athletes. It is our pleasure to recognise this contribution in naming Sarah the 2013 Female Coach of the Year. This Award is presented by Kinder Gill, Regional Head Coach at Field Hockey BC. This award is in recognition of Shiv’s contribution to coach development and mentorship over the course of the past two and a half years. Shiv has been instrumental in leading the development of sustainable high performance coaching programs that have directly improved the technical, physiological and tactical standards of our BC high performance athlete pool. Shiv has assisted both provincially and nationally in strategically identifying key elements that would allow for the implementation of the Long-Term Field Hockey Development Model across Canada and has a very clear view of the necessary steps required for our sport to improve locally, regionally, provincially, nationally and internationally. Shiv will be continuing to lead coach education within our Field Hockey BC Learn to Train Program and it is our pleasure to recognise Shiv’s contribution by naming him the 2013 Male Coach of the Year. Although there are many umpires across BC who play an integral role in the development of our sport, there is none more deserving over the course of the last two years than Erin De Sousa. Erin has been an umpire mentee within the Field Hockey BC Umpire Mentorship program for the past two seasons, has been present at more events across BC than any other umpire during this time, has worked hard with a number of different mentors to improve her umpiring and is an outstanding candidate should she choose to take her officiating to the national and potentially International level. This award recognises Erin’s development as an official to date and her potential for the future. It is our pleasure to award this year’s Umpire of the Year Award to Erin. Mark receives this award as recognition of his on-going commitment and achievement with the Canadian National Team. Mark achieved his first cap against Scotland in Vancouver in the summer of 2005. Seven years later, Mark has represented the Canadian Team at the Olympic Games, the Commonwealth Games, the World Cup and the Pan-American Games. Field Hockey BC is proud to recognise the 122 representative caps Mark has achieved for Canada in naming him the 2012 Senior Male Athlete of the Year. Regrettably, Mark is unable to be here as he is at this moment coaching the next generation of high performance athletes. Accepting the award on Mark’s behalf is Kinder Gill, Field Hockey BC’s Regional Head Coach and Assistant Coach to the Senior National Men’s Program, the award being presented by Field Hockey BC Past President, Ian Baggott. Emma was selected to the top BC Team competing at this year’s Under 18 National Championship, the team bringing back the gold medal. Her coach writes, “Emma was co-captain of the Train to Compete BC Blue Team and played an integral role in the team’s success. She controlled the midfield with her crafty elimination skills and accurate passing. Emma also scored key goals in key games and was named to the tournament XI at the National Championship”. Harkirat was selected to the top Under 15 BC Team competing at this year’s Under 16 National Championship, the team bringing back the silver medal. His Team BC coach writes, “Harkirat was the Captain and backbone of the Boys Train to Train BC Blue Team. He led by example with his work ethic and passion for the game which was evident in his skill set. Harikirat’s leadership on and off the field was important to the team and pushed everyone to be their best. He is very deserving of this award”. The Junior Under 15 Female Player of the Year award is presented to Chelsey Cleemoff for 2012. Chelsey was selected to the top Under 15 BC Team competing at this year’s Under 16 National Championship, the team bringing back the gold medal. Her Team BC coach writes, “Chelsey was an integral part of the success of the Girls Train to Train BC Blue Team and she acted as co-captain. Her complete range of speed, strength, tackling and distribution skills made her a mainstay on defense while also adding an important attacking presence. She was always enthusiastic and positive with her teammates and was one of the key reasons for the team’s cohesion and effectiveness. Chelsey demonstrated the key traits required of an athlete at this stage of development and fully deserves this recognition”. The BARBARA SCHRODT AWARD is presented to “someone who has made a difference to women’s field hockey in BC”. In fact it was Barbara Schrodt who introduced Sue to the sport of field hockey whilst Sue was a student at UBC. For many years, Sue coached and umpired at David Thompson Secondary School and for the Burnaby Ladies League, she also assisted in the organisation of the Vancouver Secondary Schools High School League and in the running of Secondary School Tournaments, and it was here, under the tutelage of Jenny John, that Sue was first introduced to the art of technical officiating. Some would say ‘the rest is history’ but bear with us….Over the last 12 years, Sue has been technical director for both AA and AAA girls high school championships, she has been a technical official for Field Hockey BC club championships, Field Hockey BC high performance tournaments, and for both Senior and Junior National Championships. In fact, Sue has been part of the technical team and ever-present for all Field Hockey BC high performance events dating back to 2005. Don has for the last 7 years served as the “Discipline Chair” for the Vancouver Men’s Field Hockey League, which gobbles up a tremendous about of his time and energy. Discipline issues arise on a very regular basis. Don gathers the reports from umpires, players and other witnesses, calmly considers the nature and extent of the alleged infractions, reviews the league by-laws and code of conduct, consults with the League’s Executive, and invariably comes up with the appropriate response. In addition to this, a great deal of the credit for improving the league’s playing and umpiring environment also must go to Don. Patrick Oswald, Past President of the Vancouver Men’s League writes, “ I personally relied heavily on Don’s sound judgment and wisdom while I served as President of the Men’s League, and cannot thank him enough for the extraordinary contribution that he has made”, “thank you to Field Hockey BC for recognizing Don at this year’s dinner. He absolutely deserves it and the recognition is long over-due”! Denise has played a significant part in the successful hosting of numerous events across British Columbia. Always professional and always conscious of the need to assist developing umpires, Denise is an invaluable asset to field hockey in BC. In recent years Denise has officiated at the Senior and Junior National Championships, Field Hockey BC high performance events, the club championships, the VIT, the BC High School Championships, and of course is active within the female junior and senior leagues in BC. Our thanks and congratulations go to Denise, accepting this award on their behalf is Paul Chohan, Field Hockey BC’s Director of Business Development, presented by Brenda Rushton, Field Hockey BC’s Domestic Director. Field Hockey BC is proud to recognise the contribution Chris Wilson has made TO and FOR Canadian umpiring over the last two decades. Chris retired as an International Umpire in December 2011 following an international career spanning 15 years and 89 internationals. However, it is not only this achievement we wish to recognise but also what Chris continues to give back to the community. Chris continues to serve as a member of the National and Field Hockey BC umpiring committees and trains and mentors umpires at all levels in Victoria. Our thanks and congratulations go to Chris, accepting this award on their behalf is Paul Chohan, Field Hockey BC’s Director of Business Development, presented by Brenda Rushton, Field Hockey BC’s Domestic Director. Over the course of the last four years, Bubli has been ever present in our Regional and Provincial programming. His role as a provincial coach has brought success with national titles at both the Under 16 and Under 18 age groups. In 2012 Bubli coached within both the regional and provincial program leading the Train to Compete Under 18 development team to fifth place at the Senior National Championship and the Bronze Medal at the Under 18 Nationals. Through the years, a large percentage of athletes under the tutelage of Bubli have gone on to receive representative Canadian honours and Field Hockey BC is very proud to have such a knowledgeable and experienced coach giving back to the next generation of athletes. It is our pleasure to recognise this contribution in naming Bubli the 2012 Male Coach of the Year. This Award is presented to Bubli by Eric Broom, Field Hockey BC’s Director of Coaching. Scott receives this award as recognition of his on-going commitment and achievement with the Canadian National Team. Scott achieved his first cap against Scotland in Vancouver in the summer of 2005. Six years later, Scott has represented the Canadian Team at the 2008 Olympic Games, at the Commonwealth Games and the World Cup and most recently at the Pan-American Games in Mexico taking his tally of international caps to 143. Field Hockey BC is pleased to recognize Scott as our Senior Male Athlete of the Year. Award presented to Scott by Mark Saunders, Field Hockey BC’s Executive Director. Diana receives this award as recognition of her on-going commitment and achievement with the Canadian National Team. Diana was selected to the Senior National Team in 2007, achieving her first cap against South Africa in Stellenbosch. Diana’s career highlights include the Commonwealth Games in 2010 and most recently the Pan-American Games in Mexico. Diana currently has a total of 71 caps for Canada. 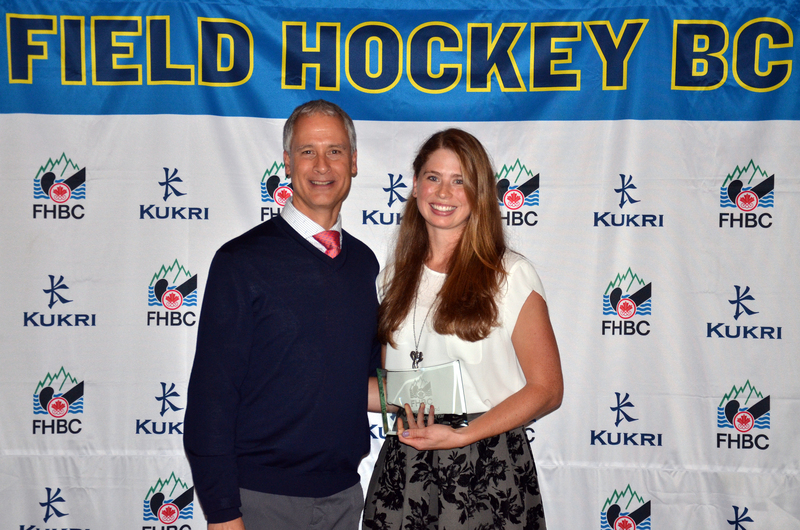 It is FHBC’s pleasure to recognize Diana as Field Hockey BC Senior Female Player of the Year. Award presented to Diana by Sue Demuynck, Field Hockey BC’s Director of Women’s High Performance. Bill Sandhu, Team BC Head Coach writes; “Gurteg Gill has performed exceptionally well in 2011. His skill level is extremely high. He has excellent game sense and his ability to perform under pressure was evident in every competitive situation”. It is FHBC’s pleasure to award the Junior Under 18 Male player of the year award to Gurteg Gill. Andrea Rushton, Team BC Head Coach writes; “Kendra was a great leader for our BC group this summer – she lead the group by example with her effort, skill, and grit, had a very positive tone with the team encouraging her teammates, yet was directive and specific when needed, and she was committed to learning from every moment”. It is FHBC’s pleasure to award the Junior Under 18 Female player of the year award to Kendra Perrin. Minder Gill, Team BC Head Coach writes; “Balraj was our team captain and most consistent player in 2011. He showed great leadership on and off the field, was able to play different positions when needed and was able to take his game to another level when the challenge demanded”. It is FHBC’s pleasure to award the Junior Under 16 Male player of the year award to Balraj Panesar. Bubli Chohan, Team BC Head Coach writes; “Sydney is the sort of player a team can count on when the pressure is on. Sydney is reliable, dependable, coachable and has a good skill set, Sydney is a quiet leader who leads by example and is thoroughly deserving of this recognition”. It is FHBC’s pleasure to award the Junior Under 16 Female player of the year award to Sydney Veljacic. The BARBARA SCHRODT AWARD is presented to “someone who has made a difference to women’s field hockey in BC”. The Barbara Schrodt Award winner for 2011 has been actively ‘making a difference’ for as long as we can remember. As a leader, manager, administrator, coach and advocate for all aspects of hockey development; whether it be within the club setting or at a provincial level, Tammy has helped advance the sport of field hockey in both a presidential and voluntary role with Delta Falcons Field Hockey Club and at a regional level with Field Hockey BC. It is our pleasure to present the Barbara Schrodt Award to Tammy McComb. Patrick Oswald continues to be an inspirational force in the promotion of field hockey at all levels of our game. Patrick has been instrumental in the development of athlete, coach and league based programming. Patrick is Past President and Current Board member to the Vancouver Hawks Field Hockey Club, Current President to the Vancouver Men’s field hockey league, past Field Hockey BC Board member and Team BC manager, and continues to assist field hockey programming in numerous ways. Our sporting community certainly continues to benefit from his experience, leadership and expertise. We hope that this award goes some way to recognizing his on-going contribution to our sport. Jenn has been a significant presence within the FHBC Regional and Provincial Program in recent years. She has graduated from an Assistant Coaching role at the Canada Cup in 2010 to a Regional Program lead coach in 2010-2011, and in the summer of 2011 led the U18 White team to a bronze medal at the National Championships and the U18 Western Canada Summer Games team to Gold in Kamloops. Field Hockey BC is pleased to recognize Jenn as our Women’s Coach of the Year. Peter Short receives this award as recognition of his significant contribution to, and achievement with, the Canadian National team. Peter’s career spanned no less than nine years from a first cap versus Belgium in Brussels on July 8th, 2001 to a highlight as a member of the Olympic Team in Beijing in 2008. 132 caps for Canada, Peter retired in 2010 and it is our pleasure to recognise these and the many other honours and achievements in naming Peter as the 2009 Male Player of the Year. David Jameson receives the 2010 Male Player of the Year Award as recognition of his on-going commitment and achievement with the Canadian National Team. Mirroring Peter’s first international cap, David achieved his milestone against Belgium in Audergheim on September 30, 2002. Eight years later, David represented the Canadian Team at the World Cup in India taking his tally of international caps to 139. ‘Man of the Series’ at the 7 Test Super Series versus India in 2009; Field Hockey BC is now pleased to recognise David as our Male Athlete of the Year for 2010. Katie and Thea were selected to the Senior National Team in 2005 and 2006 respectively. Katie achieved her first cap against a formidable Australian team in 2005 in Vancouver and Thea followed suit a year later in a test match versus Wales in Cardiff in 2006. Katie and Thea share career highlights that include the Commonwealth Games in 2006 and the Olympic Qualifier in Victoria in 2008. Katie has 69 caps for Canada and Thea has 51. They are both fully deserving of this recognition and it is our pleasure to recognise these and their many other honours and achievements in naming Katie and Thea as Field Hockey BC Female Player of the Year award recipients. Regrettably, neither Katie nor Thea were able to attend this event. Accepting the award on their behalf is past Female Player of the Year award winner, Stephanie Jameson. Award presented to Stephanie by Sue Demuynck, Field Hockey BC’s Director of Women’s High Performance. The BARBARA SCHRODT AWARD is presented to “someone who has made a difference to women’s field hockey in BC”. The Barbara Schrodt Award winners for 2009 and 2010 have both been actively ‘making a difference’ for as long as we can remember. As leaders, managers, administrators and advocates for all aspects of hockey development; whether it be within the club setting or at a provincial level, both Yvonne and Cindy have helped advance the sport of field hockey in their respective roles both within their clubs and especially as representatives for their regions. It is our pleasure to present the Barbara Schrodt Award to Yvonne Anderson and Cindy Sacré. John Nolan continues to be an inspirational force in the promotion of field hockey at all levels of our game. John has been instrumental in the development of athlete, coach and league based programming. An executive member, coach and official to the Burnaby field hockey club and executive member to the Vancouver men’s field hockey league, our sporting community certainly continues to benefit from his experience and expertise. We hope that this award goes some way to recognising his on-going contribution to our sport. Alvin Bissett has played a significant role in the success of the provincial junior men’s program for the last 3 years. Field Hockey BC would like to recognise the ‘behind the scenes’ managerial support Alvin has shown during this time, not only recognising the significant amount of work involved but most significantly the benefit this work has had on the programs as a whole and especially on the positive environment created for the coaches and athletes within the respective programs. Alvin has been manager to the Team BC – US Series in 2008; manager to the Team BC national championship program in 2009; and manager to the FHC/FHBC Pan-American Program in 2010. As if that was not enough, Alvin has now taken on the managerial role with the National junior men’s program. Lelia Sacré began on the BC officiating pathway in 2006 gaining her provincial award in the same year and achieving Regional status in 2008. Since 2006, Lelia has been invited to umpire at Field Hockey BC high performance championships, the BC club championships, the BC high school championships, the VIT, the BC/US Challenge, the BC Invitational Tournament and the National Championship program. Lelia is currently one of the short-listed BC candidates for National recognition. Our thanks go to Lelia for her contribution in recent years and it is our pleasure to recognise her development in the form of the Women’s Umpire of the Year Award for 2009. Meghan McLennan is our Female Umpire of the Year Award winner for 2010. Meghan achieved provincial status in 2004, regional status in 2007, her Canadian badge in 2008 and her FIH badge this past year in 2010. En route to these milestones, Meghan has assisted as a senior umpire to the BC high school championships and as an active umpire at Senior and Junior National Championships; the BC Invitational Tournament; the BC Club Championships; FHBC High Performance Championships; the VIT; CIS; the FHBC Junior Indoor Championships and of course at a local league level. Our thanks and congratulations go to Meghan for her contribution and achievements in recent years and it is our pleasure to recognise this contribution in the form of the Women’s Umpire of the Year Award for 2010. Al McBeth, our award winner for 2009, was certified as an officiating Course Conductor in 2008 and has since led clinics for over 100 new umpires. Al has taken the role of head umpire at FHBC events, volunteered in 2008 and 2009 to run umpire update clinics around new rule implementation in both the Lower Mainland and the Interior and continues to step forward as an active umpire for FHBC and Club junior and senior events alike. This award recognises the impact Al has had as an educator, mentor and support for official’s development in BC. Patrick Dunn for the last five years seems to have been ever present at FHBC and Club events across the province. Whether it is a junior or senior event, Patrick’s name is often the first to appear on an officiating roster. Always professional and always conscious of the need to assist developing umpires, Patrick is an invaluable asset to field hockey in BC. Over the last two years Patrick has officiated at the Field Hockey BC high performance events, the club championships, the VIT, the BC Invitational Tournament, the BC Summer Games, BC Club Invitational events, a National Series and of course is active within the male and female junior and senior leagues in BC. Recently retired from the Women’s National Team Program, our 2009 Women’s Coach of the Year, Andy Rushton plays a crucial role in FHBC’s High Performance and Team BC Programs in athlete and talent development. She is currently completing her Level 4 coaching certification with the National Coaching Institute in Victoria. Her thoughtfulness and calm demeanour are true strengths when working with excitable, but technically and tactically gifted Team BC athletes; consequently her athletes are very well prepared for competitive events. She coached the Under 18 Blue Women to a Gold medal finish at the 2009 Canada Cup, and a 4th place finish at the 2009 FHC Senior National Championships. She coached the U16 Island program in 2009-2010 and was recently appointed as Head Coach of FHBC’s U16 Island Foundations Program. Many congratulations to Andy. Our 2010 Women’s Coach of the Year Krista Thompson is a significant contributor to all levels of FHBC programming. Krista contributes to development programming for all junior age groups, including mentorship assistance within the local, regional and provincial program. Krista would no doubt say that the rewards in coaching at the local and regional level outweigh the competitive honours at a provincial level where her senior team in 2010 were successful in winning the Senior Women’s National Title. It is our pleasure to be able to recognise Krista’s contribution and the impact she has had on field hockey athlete development locally, regionally and provincially in naming her the Women’s Coach of the Year for 2010. Our 2009 Men’s Coach of the Year, Minder Gill accelerated very quickly through FHBC’s coaching pathway, and has contributed important coaching knowledge to FHBC’s Men’s High Performance Programs over the past two years. He coached in the Men’s Elite Program, working with BC’s best junior talent. That same year he led the 2009 Under 16 White Men’s Team to a Bronze medal finish at the Canada Cup and at FHC’s Under 16 National Championships, missing the final gold medal match in a sudden death shoot-out. He then followed up his successful year, as the Assistant Coach of FHBC’s National U17 Men’s Pan American Program. The Pan Am Team trained from September 2009-March 2010 and finished 4th at the first ever Youth Olympic Qualifier, held in Hermosillo, Mexico. Minder has the ability to deliver tactical knowledge that is appropriate and meaningful for Team BC players. His meticulous game planning and ability to motivate his athletes, allowed him to significantly raise the standard of play within the BC Men’s Program. Congratulations to Minder Gill, 2009 Men’s Coach of the Year. The 2010 Male Coach of the Year Award goes to the recently appointed Men’s Senior National Coach, Robin D’Abreo. This award though is in recognition of his contribution to provincial coach development and the significant impact Robin has had on BC athletes over the past five years. Robin has taken the head coach lead for no less than eleven Team BC squads since 2006. His teams have been successful at the Senior and Junior National Championships, the BC Invitational Championships, The Can-Am Challenge and most recently at the Pan-American Championships in Uruguay. Outside of his then employment obligations with Field Hockey BC, Robin over a period of nine months led squad and individual training sessions for the 2010 Pan-Am Program, resulting in the team winning the silver medal at the Pan-Am Championships. In his time with Field Hockey BC, Robin has continually gone above and beyond to create extended opportunities for coach development and to meet the ever increasing demands of the BC high performance athlete base. The BARBARA SCHRODT AWARD – presented to “someone who has made a difference to women’s field hockey in BC”. This year’s Barbara Schrodt Award winner has been actively ‘making a difference’ for as long as we can remember. A leader, coach, manager, administrator and advocate for all aspects of hockey development; whether it be within the club setting or at a provincial level, it is our pleasure to present the Barbara Schrodt Award to Deneen Asano. Award presented by Sue Demuynck to Deneen Asano. Robin Richardson continues to be an inspirational force in the promotion of field hockey at all levels of our game. He has been President of the Men’s League, Field Hockey Victoria and Co-Chair of the junior league. On field hockey’s behalf Robin is currently a Pacific Sport Victoria trustee and was part of the voluntary team instrumental in bringing the Olympic Qualifier to Victoria earlier this year. Robin continues to play a managerial role in the promotion and development of the men’s national team program as well as taking a lead in initiatives to further field hockey opportunities in Victoria and across the province. It is our pleasure to present the contribution to Men’s Field Hockey to Robin Richardson. Award presented By Ian Baggott to Robin Richardson. Having coached both Regionally and Provincially over the last 3 years Lauren MacLean has been a fantastic addition to the High Performance Coaching staff. A former National Team athlete, Lauren brings a wealth of knowledge, experience, and drive to her teams and creates a very positive and supportive learning environment for all her athletes. In 2007/08 Lauren Head Coached both the South East U18 Regional Squad to a bronze medal finish at the U18 HP Championships as well as the Provincial U19 BC White Team that captured a silver medal at the U18 National Championships in Winnipeg. It is our pleasure to present the Women’s Coach of the Year Award to Lauren MacLean. Award presented by Sue Demuynck to Lauren MacLean. Aaron Guest has become a staple of the men’s high performance coaching at Field Hockey BC. He has coached regularly with the Junior Boys U18 and U16 Elite programs since their inception 3 years ago. Aaron brings a simple no nonsense approach to his coaching that stresses excellence and individual accountability with all his athletes. In 2008 Aaron Head coached the U16 Provincial Men’s team that captured the Gold medal at the FHBC Invitational tournament as well as a 3 Match USA Challenge Series win in Moorpark California over the US U17 National Squad. It is our pleasure to present the Men’s Coach of the Year Award to Aaron Guest. Award presented by Ross Stewart to Aaron Guest. Alison ‘gives back’ in so many different ways to field hockey on Vancouver Island and across BC and Canada. Alison is not only a nationally rated umpire, she is also a course conductor, assessor and mentor for umpiring development. Last year saw Alison officiate at the Senior and Junior National Championships; the BC Invitational Tournament; BC Club Championships; BC High Performance Championships; the VIT; the BC Junior Indoor Championships and of course at a local league level. Our thanks and congratulations go to Alison for her contribution over the past year and it is our pleasure to recognise this contribution in the form of the Women’s Umpire of the Year Award. Award presented by Paul Chohan to Julie Brereton on behalf of Alison Sweeten. Over the last three years Gavin has risen through the umpiring ranks. Gaining his Regional Award in 2006/2007; Gavin was invited to umpire at the Senior National Championships in 2008 gaining his certification as a Canadian Umpire. The last year saw Gavin umpire at the Field Hockey BC high performance championships, the club championships, the VIT, the BC/US Challenge, the BC Invitational Tournament, the Junior and Senior Nationals and of course within the men’s and women’s league. Our thanks and congratulations go to Gavin for his contribution and significant achievements over the past year and it is our pleasure to recognise his development in the form of the Men’s Umpire of the Year Award. Award presented by Paul Chohan to Gavin Caldecott. Christine has been a part of the Women’s National squad since 2006, and has played 48 games for Canada. She represented Canada at the 2007 Pan American Games and more recently at the 2008 World Hockey Olympic Qualifying Tournament in Victoria. Notable honours include the 2007 Premier’s Athletic Award and the 2007 CIS player of the year award. Christine has played provincially since her days in grade 10 and has played for both the University of Manitoba and the University of British Columbia, graduating in 2007. It is our pleasure to recognise these and the many other honours and achievements in naming Christine as this year’s Female Player of the Year. Award presented by Sue Demuynck to Christine De Pape. Bindi is a veteran of the Canadian Men’s National Team having represented the senior men’s team since 1996. Bindi has 155 senior caps to his name and was a member of the Canadian Men’s team who recently finished 10th at the 2008 Beijing Games in China. Bindi has represented Canada at two Olympic Games, two Commonwealth Games, two Pan-American Games and a World Cup. Some would say it is about time he won this award! It is our pleasure to recognise these and the many other honours and achievements in naming Bindi as this year’s Male Player of the Year. Award presented by Ian Baggott to Narinder Sangha on behalf of Bindi Kullar. The BARBARA SCHRODT AWARD – presented to “someone who has made a difference to women’s field hockey in BC”. This year’s Barbara Schrodt Award winner has been actively ‘making a difference’ for as long as we can remember. A leader, coach, manager and advocate for all aspects of hockey development; whether it be within the club, provincial or national field, it is our pleasure to present the Barbara Schrodt Award to Jane Kozniuk. Sumesh Putra, undoubtly Canada’s top international umpire, has enjoyed a distinguished career that includes officiating assignments at the Olympic Games, the World Cup, the Pan-Am and Commonwealth Games and the prestigious Champions Trophy. But it is not his international experience that leads Field Hockey BC and the field hockey community to nominate Sumesh for this award. Our nomination is for the contribution and the continued impact Sumesh brings to the development of officiating in BC and Canada. Despite his international experience, standing in over 100 international matches, Sumesh is the first to assist the development program in BC and can be seen at venues across the lower mainland mentoring league officials at weekends and assisting with the provincial tournament calendar. Sumesh also volunteers his time as an advisor and coordinator to the local leagues and as a member of the Field Hockey BC umpiring committee. Sumesh continues to give back to the sport he loves and in particular give back to the community that gave him the opportunity to fulfill his potential. Sumesh continues to umpire, assess, mentor and coordinate at all provincial levels and we hope that this award will go some way to expressing our gratitude for the contribution he continues to make. Krista Thompson is Field Hockey BC’s Regional Head Coach for Vancouver Island and a significant contributor to all levels of FHBC programming. She was a head coach within the women’s Regional Program for both the 05-06 and 06-07 seasons coaching a U18 Island team on both occasions. She was also Head Coach of the Senior Women’s provincial team leading them to a silver medal finish at the National Championships. In her capacity as Regional Head Coach, Krista also contributed to development programming for all junior age groups as well as to the U18 Elite Boys program running local training for our Island contingent. Her tireless commitment and dedication to the program continue to make a very positive impact on the field and it is our pleasure to be able to recognise Krista’s contribution with the women’s Coach of the Year Award for 2006/2007. In 2006 Kimo contributed his expertise to all aspects of our high performance system coaching men and women within our Development, Regional, and Provincial Programs. In the spring he ran Women’s U21/ Senior development sessions and also head coached the SE U18 Women in the Regional program. He then took on the Senior Men’s Provincial Team leading them to a gold medal finish at the Senior National Championships. In the fall Kimo also made a significant impact on our Elite Boys programming by Head coaching the squad through the 2006-07 season. His significant experience and passion for the game are always a huge asset to FHBC and the talented athletes we have participating in our programs. It is our pleasure to be able to award the men’s coach of the year for 2006/2007 to Kimo. Over the last three years Gillian has risen through the umpiring ranks. Gaining her Regional Award in 2005; Gillian was invited to umpire at the Senior National Championships in 2006 gaining her certification as a Canadian Umpire. Gillian has umpired at the Field Hockey BC high performance championships, the club championships, the VIT, the Can-Am Challenge, at Junior Nationals and more recently the Canada/Chile series here in BC. It is fitting that we are recognising, in both of this years umpire of the year categories, individuals that we hope will be the next generation of top flight Canadian officials. Our thanks and congratulations to Gillian for her contribution over the past year. Jon has been one of BC’s up and coming umpires over the past few years and has progressed quickly through the umpiring ranks. Awarded his Regional Rating last year; Jon has had a busy year umpiring at the BC High performance Championships, the Can-Am Challenge, the BC Challenge, the VIT and the Club Championships to name but a few. The culmination of this hard work has been an invitation to umpire at both the senior and junior national championships this summer where Jon will be assessed for his national certification. We wish him luck and a debt of gratitude for his contribution over the past year. Unfortunately both our player of the year award winners are attending family Pan-Am Games send off’s and are unable to be with us but both have nominated peers to accept these awards on their behalf. Stephanie Hume (aka Barney) has been a part of the Women’s National squad since 2002, and has played 48 games for Canada. She has played in the 2002 and 2006 Commonwealth Games, and was recently named to the 2007 Pan American Games Team following a successful series against Chile. She has played provincially for BC since 1997, and last summer was an integral part of the BC team that captured gold at the 2006 Senior National Championship. Steph grew up playing for the West Vancouver Field Hockey Club, and has given many hours of her time to help coach junior teams within the club. She played for the University of British Columbia Thunderbirds from 1997-2001, and now plays for the Meralomas club in Vancouver. Ravi Kahlon started playing field hockey in the Victoria league at the age of 12, he was selected as a Provincial BC athlete at Under 18 level and was selected to represent the junior national team in 1999. Ravi’s first international cap came in 2000 against Malaysia and since then Ravi has represented Canada on no fewer than 106 occasions. Last year saw Ravi compete at both the 2006 Commonwealth Games in Australia and the 2006 World Cup Qualifying Tournament in China. On the domestic front, Ravi continues to play for the Victoria Selects and commits a great deal of time to developing junior players in his region and across British Columbia.